In a medium bowl, combine avocado, yogurt, lime juice, and seasonings. Mix until mostly smooth and uniform. For the cake: Preheat the oven to 350°F. Grease two 9-inch round cake pans with butter and line the bottom of each with parchment. Whisk together the flour, baking powder and salt in a medium bowl. Whisk the milk, vanilla, eggs and egg yolk together in another medium bowl. Beat the butter and sugar in a large bowl with an electric mixer on medium high until light and fluffy. Add about a third of the flour mixture and beat on medium low until incorporated. Now add a third of the egg-milk mixture and continue to beat on medium low until incorporated, scraping down the sides of the bowl as needed. Repeat with the remaining flour and egg-milk mixtures, finishing with the flour. Divide the cake batter evenly between the prepared cake pans and bake until the cake bounces back when pressed and a toothpick inserted in the center comes out clean, 35 to 40 minutes. Let cool completely in the cake pans on a rack. For the frosting: Bring a few inches of water to a boil in a saucepan that can hold a heatproof stand mixer's bowl above the water. Add the sugar, lemon juice, salt and egg whites to the mixer bowl and whisk together by hand. Set the bowl above the boiling water and whisk until the mixture is warm to the touch and the sugar completely dissolves. Transfer to the stand mixer fitted with the whisk attachment and beat at medium-high speed until cool and the whites hold stiff peaks, 10 to 15 minutes. For the filling and decoration: Dye the coconut: Have ready 5 resealable plastic bags or plastic containers. Put 1 1/2 cups of the coconut in one container with 6 to 8 drops of blue food coloring. Put 1 cup of coconut in the second container with 5 to 6 drops of orange food coloring, 1 cup of coconut in the third with 5 to 6 drops yellow food coloring and 1 cup of coconut in the fourth with 6 to 8 drops purple food coloring. Put the remaining 1/2 cup coconut in the fifth container with 4 to 5 drops pink food coloring. Seal each container and shake vigorously until the coconut is evenly dyed. Add more food coloring 1 drop at a time as needed to get bright, vibrant colors. Assemble the cake: Cut a 4-inch circle out of the center of each cake (reserve the small cut-out cake rounds). Put one of the cake rings on a cake stand or serving platter and frost with about 1 cup of frosting. Put the other cake ring on top and push down slightly. Fill the hole with candy. Cut one of the reserved cake rounds in half horizontally to make 2 thinner rounds. Use one to fill the hole on top of the cake. Frost the top and sides of the cake with the remaining frosting. Cut a strip of parchment about 30 inches long and 3 inches wide. Wrap this parchment around the cake like a collar, leaving 1 inch of frosting exposed around the bottom perimeter of the cake. Pack some of the blue coconut onto the exposed frosting to make your first strip of color. Lift the collar up another 1 inch and do the same with the orange coconut. 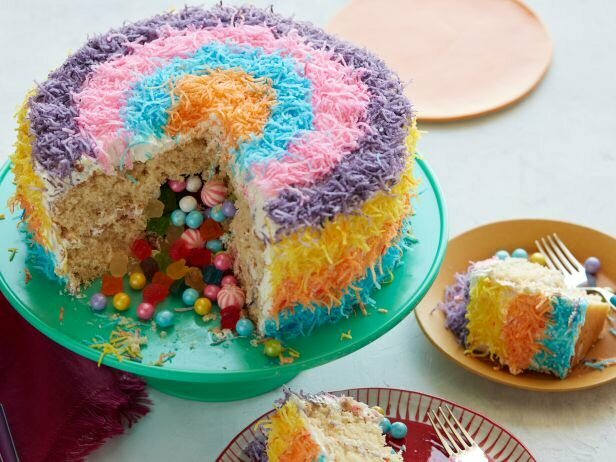 Remove the collar and fill the remaining inch of frosting with the yellow coconut. For the top, make 1-inch-wide rings, starting on the outside and working your way in, with the purple, pink, blue and orange coconut until the top is completely covered. Let sit at room temperature for at least 1 hour before serving. Preheat oven to 400°F. Line a baking sheet with parchment paper (or two if they don’t fit). Cut the squash in half lengthwise, and use a spoon to scrape out the seeds and soft yellow strands. Brush the inside of the squash with 2 teaspoons of olive oil and sprinkle lightly with salt and pepper. Place the squash facedown on the baking sheet and bake for 45-50 minutes or until the flesh easily pierces with a fork. Top evenly with the cheese and transfer them to the oven and bake another 15 minutes, until the cheese is melted and the sauce is hot. Remove from the oven, sprinkle with cilantro and scallions and serve immediately! Pre-heat the oven to 375°F. Lightly mist a 12-cup standard muffin tin with cooking spray and set aside. Heat chili oil in a sauté pan or large skillet over medium-high heat. Add the ground beef brown, breaking it up with a spoon. When meat is cooked through, add the taco seasoning and stir together. Add the black beans and continue to cook, stirring occasionally, for 1-2 more minutes until warm. Remove from heat and stir in salsa until well combined. Push a wonton wrapper into the bottom of each of the cups in the prepared muffin tin. Spoon a teaspoon of queso dip into each wonton cup and spread across the bottom. Follow by spooning some of the meat/beans mixture into each cup, using about half the total mixture. Sprinkle about half the shredded cheese evenly over the top of each cup. Press another wonton wrapper on top of the shredded cheese and repeat the layering steps with the remaining ingredients. For the Cakes, preheat oven to 350°F. 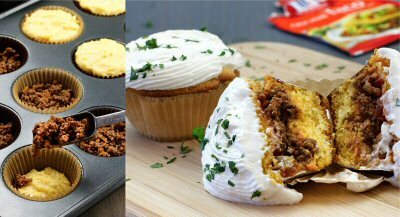 Generously spray 8 (6-ounce) oven proof coffee cups or ramekins with no stick cooking spray with flour or grease and flour cups. Place on large baking sheet. Mix flour, 2/3 cup of the granulated sugar, 4 tablespoons of the cocoa powder, baking powder, ancho chile pepper, cinnamon and salt in large bowl. Stir in milk, oil and vanilla. (Batter will be stiff.) Spoon evenly into prepared cups. Mix remaining 1/3 cup granulated sugar and 2 tablespoons cocoa powder in small bowl. Sprinkle evenly over batter. Spoon 2 tablespoons boiling water into each cup. (Do not stir). Bake 15 to 20 minutes or until tops are dry to the touch. Cool cups slightly on wire rack. For the Cocoa Whipped Cream, beat cream and confectioners' sugar in medium bowl with electric mixer on high speed until soft peaks form. Add cocoa powder and vanilla; beat until stiff peaks form. 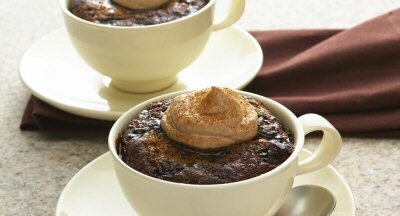 Serve cakes in coffee cups while still warm. Dollop with Cocoa Whipped Cream. Sprinkle with additional cinnamon, if desired. Serves 8. Cooking tip: Make Ahead: Prepare and bake cakes as directed. Store in refrigerator overnight. To reheat cakes, microwave on HIGH 30 to 60 seconds or until heated through. Spray a spring form, round cake pan or casserole with cooking spray. Brown ground beef ,and onion and drain. Add taco seasonings and cook according to package direction. Lay 1 tortilla in bottom of baking dish and spread 1/3 of bean on it, top with 1/3 of the meat and sprinkle on some cheese. 2nd layer tortilla, 1/2 the rice, 1/2 salsa, 1/2 the corn and cheese. 3rd layer tortilla, 1/3 beans ,1/3meat, cheese. 4 layer tortilla . beans ,meat, corn, rice, salsa and cheese. Bake covered with foil at 350°F for about 40 minutes uncover and bake 10-15 minutes longer. let sit 5 minutes before cutting. After baking top with sour cream,diced onion and shredded lettuce if desired. Toss all ingredients in a bowl. Season with salt and pepper. For salsa: In a mixing bowl combine mango, kiwifruit, green onion, red sweet pepper,ginger, lime juice, cilantro, brown sugar, and ground red pepper. Toss to coat well. Coverand chill for 1 to 4 hours. Preheat the oven to 350°F. Spray and flour a 10-inch cake pan with 2-inch high sides and then line with parchment paper. Grease the parchment paper. Mix the flour and baking powder in a medium bowl. Set aside. In a large mixing bowl, using an electric mixer with the whisk attachment, whip the egg whites until frothy. With the mixer running, gradually add the sugar and beat to stiff peaks. Beat in the yolks, 1 at a time, blending well after each addition. Add the flour mixture in 3 additions, alternating with the whole milk in 2 additions. Pour the batter into the prepared pan and bake until a tester inserted into the center comes out clean, about 30 minutes. Cool the cake slightly, about 10 minutes, then invert onto a platter with 1-inch high sides. Pierce the top of the cake all over with a thick skewer. Mix the sweetened condensed milk, evaporated milk, 1 cup heavy cream and orange liqueur in a medium bowl. Pour the mixture over the cake while warm. Cover and refrigerate until cold, about 3 hours or overnight. Chili Powder ( to u'r taste). Mix all (except tortillas) in a large pan on stove & heat through. Spray a 13x9 in with Pam. Cover bottom of pan with a few tortilla strips & then cover with chicken stuff, then a little cheese. Coat a 2-quart round casserole with nonstick spray; set aside. Coat an unheated large nonstick skillet with nonstick spray. Heat skillet over medium-high heat. Add corn; cook about 5 minutes or until corn begins to lightly brown. Add potatoes; cook and stir 5 to 8 minutes longer or until potatoes begin to brown. Stir in tomatoes, chipotle peppers, 1/2 teaspoon chili powder, 1/2 teaspoon cumin, and the oregano. Remove from heat; transfer mixture to the prepared casserole. Wipe skillet clean. Add oil to skillet and heat over medium-high heat. Sprinkle chicken evenly with 1/4 teaspoon salt, 1/4 teaspoon chili powder, and 1/4 teaspoon cumin. Brown chicken in hot oil, turning once to brown both sides (about 3 minutes on each side). Place chicken on top of potato mixture in casserole. Preheat oven to 350°F. Lay each poblano pepper on it¿s side and cut a lengthwise slice from one side, leaving the stem intact on the pepper. The pepper will now be boat shaped. Chop each slice of pepper which was just removed. Set aside. Remove seeds and membranes from each poblano pepper. In a large saucepan cook peppers, half at a time, in boiling water for 2 minutes. Drain well; set aside. For filling, combine chicken, 1/2 cup of the cheese, corn, cream cheese and 2 tablespoons cilantro. Spoon filling into poblano peppers and place in a greased 3-quart rectangular baking dish. For sauce, in a large skillet cook onion, the reserved chopped poblano pepper and garlic in hot oil over medium-low heat for 5 minutes or until tender, stirring occasionally. Stir in tomato sauce, cumin, coriander, salt, and ground red pepper. Cook and stir until bubbly. Spoon sauce over stuffed peppers in baking dish. Bake, covered, for 20 to 25 minutes or until heated through. Sprinkle with the remaining 1/2 cup cheese. Bake, uncovered, 2 minutes more or until cheese is melted. Sprinkle with remaining 2 tablespoons cilantro before serving. Makes 6 servings. *Note: Because chile peppers, such as poblanos, contain volatile oils that can burn your skin and eyes, wear plastic or rubber gloves when working with them. If your bare hands do touch the chile peppers, wash your hands well with soap and water. Layer the crumbled chips, chicken, corn and picante sauce in a 1-quart casserole. Top with the olives and cheese. Heat oven to 375°F. Lightly coat a 3-quart rectangular baking dish with cooking spray; set aside. For filling, stir together turkey, half the tomatoes with juice, beans, 1/2 cup salsa, 1/2 cup cheese, sour cream, scallions, cilantro, cumin, salt and pepper. Spoon about 2/3 cup filling on each tortilla. Roll tortillas around filling. Place, seam sides down to hold tortillas together, in prepared dish; set aside. For sauce, stir together remaining tomatoes and juice, salsa and hot pepper sauce. Spoon over enchiladas. bake 5 to 10 min more or until heated through and cheese is melted. Sprinkle with additional cilantro and scallions. Combine the turkey, half of the picante sauce, cream cheese, onion, cumin and oregano in a skillet. Place over low heat until the cheese melts. Stir in 1 cup of shredded Monterrey Jack cheese. Spoon mixture evenly onto the tortillas. Roll up and place with the seam side down in a greased baking dish. Spoon over the rest of the picante sauce and sprinkle on the rest of the cheese. Bake at 350°F for 15 minutes. Mix peppers, onions, oil, lime juice and cumin in 13x9-inch baking pan. Coat chops as directed on package. Discard any remaining coating mix. Place chops on onion mixture. Bake at 425°F for 20 minutes or until chops are cooked through. Cut chops into slices. remaining cheese. (I like to pour some of the sauce in the bottom of my dish before adding the enchiladas.) Bake in 350 F preheated oven for 25 to 30 minutes. Makes about 6 servings. For tortilla bowls, wrap tortillas in foil. Warm in a 350 degree F. oven for 10 minutes.Spray four 10-ounce custard cups with nonstick spray coating. Carefully press 1 tortilla intoeach cup. Bake in a 350 degree F. oven for 15 minutes or until crisp. Cool; remove fromcustard cups. Meanwhile, in a large skillet cook meat, onion, and garlic until meat is no longer pink andonion is tender. Drain fat. Stir in tomato sauce, vinegar, cumin, and red pepper. Bring to boiling; reduce heat.Simmer, uncovered, for 10 minutes. Divide lettuce among 4 serving plates. Place a tortilla on each plate. Spoon beef mixtureinto tortillas. Sprinkle with green or sweet red pepper and cheese. Serve with cherry tomatohalves. Makes 4 servings. Make ahead tip: Prepare tortilla bowls. Place in large freezer container with paper towelsbetween bowls and crumpled around sides to protect the shells. Seal, label, and freeze upto 1 month. Combine crumbs, marg. and sugar, press firmly into pie plate. In bowl, combine lime, milk, tequila & triple sec, mix well. Fold in whipped cream. Pour into crust. Freeze. To make the caramel: Have ready a 2-quart round flan mold and a large roasting pan. Combine 1 cup of the sugar and 2 tablespoons of water in a heavy-bottomed pot or pan. Place over medium-high heat and cook until the sugar begins to melt. Swirl the pan over the heat until the syrup darkens to a medium amber color, about 10 minutes; don't stir with a spoon. Remove from the heat and immediately add the lemon juice, swirl the pan again to combine, and then pour into the flan mold. Tilt the dish so that the caramel evenly coats the bottom and a bit up the sides, place in the roasting pan and set aside. Preheat the oven to 325°F, bring a kettle of water to a boil for the water bath and keep it hot. Combine the cream, cinnamon, and vanilla in a small saucepan over medium-low flame. Bring the cream to a brief simmer, stirring occasionally. Take care not to let the cream come to a full boil to prevent it from spilling over. In a large bowl, cream together the whole eggs and yolks with the remaining 1/2 cup of sugar; add a pinch of salt. Whisk until the mixture is pale yellow and thick. Temper the egg mixture by gradually whisking in the hot cream mixture; don't add it too quickly or the eggs will cook. Pass the mixture through a strainer into a large measuring cup to ensure that the flan will be perfectly smooth. Pour the custard into the caramel-coated mold. Preheat the oven to 350°F. Line a 9-by-13-inch baking dish with parchment paper, leaving an overhang on two sides. Press the paper into the corners of the pan and lightly grease the paper with butter. Coat beef with flour, dusting off excess. Brown beef, seasoning with salt and pepper. Mix spices, tomato paste, both and water. Add to crockpot and cook on low for 6 to 8 hours. In a medium mixing bowl stir together all ingredients until blended. Using a tablespoon, spoon batter into mini-muffin tins, filling to the rim. Bake in preheated oven 15 minutes or until golden brown. NOTE: For standard 2 1/2-inch muffins: spoon batter into 18 to 20 muffins cups; fill 2/3 full. Put first 4 ingredients in pot (and beans), bring to boil, add taco seasoning (to taste), stir well, then lastly add cheese and cilantro. Boil water, cinnamon and cloves until dark color. Add sugar boil about 1 minute and set aside. Slice rolls about ½ inch pcs and lay on cookie sheet toast, butter and set aside. Mix walnuts, almonds, peanuts and raisins and set aside. Slice apple, bananas, and cheese and set aside. Warm tortillas and set aside. Butter pan and lay tortillas in bottom of pan. Layer sliced rolls add half mix nuts and spread over bread. Add half apples and bananas. Add half of the cinnamon water mix over the layer of cheese. Repeat layering, bread, nut mix, fruit cheese, cinnamon mix and cover with tortillas. Cover pan with lid or foil. Bake 2 hrs at 350°F. Preheat oven to 375°F. Line a shallow baking pan with nonstick foil. Rinse chicken breasts and pat dry. Pound chicken to about 1/4-inch thickness, until flat. In a bowl, combine cornmeal and taco seasoning mix. Place egg in a separate bowl. For each roll place Cheddar cheese strips, green chiles, cilantro, and crushed red pepper flakes near edge of one pounded breast. Fold in sides and roll, starting from the cheese/pepper side. (Secure with toothpick, if necessary, but remember to remove the toothpick before serving.) Dip rolls in egg, then roll in cornmeal mixture. Place chicken rolls, seam-side down in prepared pan. Bake uncovered for 25 to 30 minutes. Sprinkle with shredded cheese the last 5 minutes of baking. Serve topped with heated salsa. FOR CARAMEL: In a saucepan over medium heat, combine the sugar and water. Cook, swirling the pan occasionally, until the mixture begins to turn golden, 12-15 minutes. Reduce the heat to low and continue cooking and swirling occasionally until the mixture is dark brown and smells of caramel, about 5 minutes. Remove the caramel from the heat and pour into a 9-inch round cake pan or eight 3/4-cup custard cups. Using a kitchen towel or hot pad, tilt the pan or cups, swirling the caramel to coat the bottom and sides evenly. Let stand for a few minutes; the caramel will cool down and form a layer about 1/4 inch thick on the bottom and sides. Then pour the excess caramel back into the saucepan it was cooked in. FOR FLAN: Pour the milk into the saucepan holding the excess caramel and place over low heat. Cook, stirring frequently, until the caramel has dissolved in the milk, 3-5 minutes. Strain the warm milk mixture through a fine-mesh sieve set over a bowl. Add the half-and-half and stir to mix well. Add the sugar, whole eggs and egg yolks, and vanilla. Whisk until blended, then strain through the fine-mesh sieve into the prepared pan or cups. Set the pan or cups in a roasting pan and place the roasting pan in the oven. Pour boiling water into the roasting pan to reach halfway up the sides of the cake pan or custard cups. Bake until the center of the custard(s) feel just firm when pressed gently with the fingertips, 45-55 minutes for the large pan or 30-40 minutes for the individual cups. Remove from the oven and let cool for about 1 1/2 hours. Then cover with plastic wrap and refrigerate overnight or for up to 4 days. TO SERVE: Run a knife along the inside edge of the pan or cups to loosen. Invert a serving dish over the pan or a saucer over each cup. Quickly invert and carefully lift off the pan or cup. Carefully pour excess caramel into a small sauce pitcher. Serve chilled. Offer the extra caramel alongside. Flavor Variation: for Picante Chicken & Rice Bake, use 1 jar (16 ounces) Pace® Picante Sauce and omit the soup. Proceed as directed above. For the Brownies, prepare brownie mix as directed on package. Stir in chocolate chips, vanilla and cinnamon. Meanwhile, for the Frosting, mix chocolate frosting and cinnamon. Spread over cooled brownie. Cut into squares. Place tortillas in a pie plate with 1 cup broth. Turn once in awhile to ensure all tortillas are soaked, set aside. Place a large nonstick skillet over medium-high heat and add olive oil. Saute onions, peppers, garlic and mushrooms for 5 minutes until slightly browned. Add turkey and cook until turkey is cooked through, about 7 to 9 minutes. Add remaining 1/4 cup chicken stock and remaining ingredients, except cheese and tortilla chips. Stir thoroughly and bring to a boil. Reduce heat and simmer for 5 minutes. Place 4 soaked tortillas in the bottom of prepared baking dish, tearing to fit. Layer half of turkey mixture and half of cheese. Repeat layers. In a bowl, toss chicken with chili powder. In a 4-quart pot or Dutch oven, cook garlic in hot oil over medium heat for 15 sec and add chicken. Cook, stirring, 3 min. Add broth, 1-1/2 cups water, beans and corn. Bring to a boil, stirring frequently. Stir in pasta. Reduce heat and simmer, covered, 10 min or until pasta is tender, stirring occasionally.Stir in tomatoes; heat through. Top each serving with cilantro. Serves 6. 2 c. shred. ched., div. In large skillet, crumble together the beef and chorizo. Cook over med. heat, stirring until meat is browned. Add onion & garlic; cook until onion is limp. Drain off fat. Line a 9X9" baking dish with half of the chilies; top with 1-1/2 cups of the cheese. Add the meat mixture and top with remaining chilies; set aside. Beat together eggs and flour until smooth; add milk, salt, Tabasco. Blend well. Pour the egg mixture over casserole. Bake, uncovered, at 350 F for about 40 min. or until knife inserted off center comes out clean. Sprinkle remaining ½ c. cheese on top. Let stand 5 min. before serving. Cut poblano chiles in half lengthwise to create a boat for filling: scrape out seeds. Heat olive oil in nonstick skillet. Add onion, garlic, jalapenos, bell pepper, cilantro and cumin and cook over med. heat until golden brown, 4 min. Remove from heat and stir in baked beans, hot sauce and 8z cheese. Add salt and pepper to taste. Spoon the mixture into the hollowed chiles and sprinkle with remaining cheese. Preheat grill to medium. Arrange chiles on grill away from heat. Cook until chiles are tender and cheese is browned and bubbling, 30-40 min. Grind these spices in a coffee grinder. Use this grinder for spices only, no coffee. Combine wet mixture and dry mixture in a blender and blend well. Pour the mixture into a large ziplock bag, including the lemon juice and Tequila. Add the meat and marinate for several hours in fridge. Line a 13" baking pan with the banana leaves, allow leaves to hang over the sides, pour in contents of ziplock bag, use excess overhanging leaves to finish wrapping pork mixture and tightly cover with foil, so no steam escapes. For marinade, in a medium mixing bowl combine fajita mix, water, and oil. Rinse chicken; add to marinade. Stir to coat. Let stand at room temperature for 15 minutes. Spray a wok or large skillet with nonstick coating. Preheat over medium heat. Add sweet pepper, zucchini, and onion; stir-fry for 2 to 3 minutes or until crisp-tender. Remove from wok. Drain chicken; discard marinade. Add chicken to wok. (If necessary, add 1 tablespoon cooking oil during cooking.) Stir-fry for 4 to 5 minutes or until no pink remains. Return vegetables to wok. Stir together salsa and chili powder. Add salsa mixture, corn, and beans to wok. Cook and stir for 1 to 2 minutes more or until heated through. Serve with warm tortillas and cheese, if desired. (To heat tortillas, wrap in microwave-safe paper towels; micro-cook on high power for 30 seconds). Makes 4 servings. In small bowl or mortar, mash garlic, parsley, saffron and salt. Set aside. Heat olive oil in paella pan with a 15" base. Add pork and rabbit. Fry, stirring a few minutes. Remove to warm platter. Add chicken, sprinkled with salt, and fry over high heat until golden on all sides. Remove to warm platter. Add squid. Sprinkle with dash of salt. Remove to warm platter. Add shrimp and saute about 3 min. or until barely pink. Remove to warm platter. Add onion, tomato and peppers. Saute until soft. Return cooked pork, rabbit, chicken, and shrimp to the pan. Add parsley-garlic mixture. Add cooked mussels. Stir in rice, and juice of 1 lemon. Fry 2 or 3 minutes. Pour over the hot fish broth, while stirring. Bring to fast boil. Simmer for 20 min., without stirring. Turn off heat and shake pan lightly to prevent rice from sticking. Cover with dry towel for 10 minutes. This allows rice to absorb any excess broth. Garnish with lemon wedges and parsley sprigs before serving. Tips: The final parsley sprinkling-put parsley into olive oil and refrigerate for 1 hour before sprinkling over cooked paella. Quarter the peppers and remove stems, seeds, and veins. Immerse peppers into boiling water for 3 minutes. Drain. Invert on paper towels to drain well. Place half the peppers in a well-greased 1-1/2-quart casserole. Top with half of the shredded Monterey Jack cheese. Repeat layers. In a medium mixing bowl combine eggs and milk. Add flour, baking powder, red pepper, and salt. Beat until smooth. Pour egg mixture over peppers. Bake, uncovered, in a 450° F oven for 15 minutes or until set. Sprinkle with the shredded cheddar cheese. Let stand about 5 minutes or until cheese melts. Serve with picante sauce and sour cream. Spray crock pot with Pam. Place meat in crock pot and top with salsa. Place cover on pot and cook for 8 hours. Take meat out and shred onto serving platter. Make tacos, enchilladas or burritos. Heat oil in med. skillet over med. heat. Add peppers and onion; cook, stirring constantly, for 3-4 min. Remove from skillet. Add chicken to skillet; cook, stirring constantly, for 4-5 min. Add onion-pepper mixture, 1 cup salsa and jalapenos; heat through. Spread 1 tbl. guacamole on each tortilla. Top with ½ cup chicken mixture and 2 tbl. cheese; fold into burritos. *Marinade chicken at least 2 hours prior to cooking. In a medium bowl, combine the lime juice, green onions, garlic, cilantro, oil, red pepper, coriander and anise, if desired. Whisk all the ingredients together. Coat mixture over your favorite meat, cover, and refrigerate for 12 to 24 hours. Bring butter and next 3 ingredients to a boil in a medium saucepan; reduce heat, and simmer, stirring constantly, 3 minutes. Pour over enchiladas, let stand 30 minutes. Thaw chicken. In a medium mixing bowl combine chicken, jicama, and the 1/2 cup taco sauce; set aside. Place one of the flour tortillas on a platter. Spread with half of the chicken mixture. Spread half of the avocado dip onto a second tortilla; place, avocado side up, atop chicken. Sprinkle with half of the lettuce. Top with a third tortilla; spread with half of the beans. Top with another tortilla; add half each of the sour cream, red pepper, green onions, and cheese. Repeat layers, ending with remaining sour cream, red pepper, green onions, and cheese. Sprinkle with olives. Serve immediately or cover and chill for up to 3 hours. To serve, cut into wedges. Pass taco sauce. Makes 8 main-dish servings. Make-Ahead Tip: Assemble tortilla stack. Cover and chill up to 3 hours. In a small bowl combine the tomato, onion, lime juice, cilantro, jalapeno, salt and pepper. Set the pico de gallo aside. In a large skillet, heat 1/4 tablespoon of the olive oil. Add the chicken breast meat and saute until cooked through and juices run clear. Remove chicken from skillet and set aside. Put the remaining 1/4 tablespoon of olive oil in the hot skillet and saute the onion and green pepper until tender. Stir in the minced garlic and saute until the aroma is strong. Finally, mix in half of the pico de gallo and the previously sauteed chicken breast meat. Set this mixture aside; keep warm. With an electric mixer, beat butter or margarine until fluffy. Gradually beat in masa harina. On low speed, beat in water. Place corn in the bowl of a food processor, or use a blender and pulse until chopped coarse. Stir in masa mixture. In a small bowl, stir together sugar, cornmeal, cream, baking powder, and salt. Stir into corn mixture. Spread in a greased, 8-inch-square baking pan. Cover with foil. Place in a larger pan and pour boiling water half way up the side of the smaller pan. Bake at 350°F for 50 minutes or until set. Remove smaller pan from water, uncover, and let stand 15 minutes. Sprinkle with chilies and parsley, if desired. Makes 8 servings. For tortilla bowls, wrap tortillas in foil. Warm in a 350° F. oven for 10 minutes. Spray four 10-ounce custard cups with nonstick spray coating. Carefully press 1 tortilla into each cup. Bake in a 350°F oven for 15 minutes or until crisp. Cool; remove from custard cups. Stir in tomato sauce, vinegar, cumin, and red pepper. Bring to boiling; reduce heat. Simmer, uncovered, for 10 minutes. Divide lettuce among 4 serving plates. Place a tortilla on each plate. Spoon beef mixture into tortillas. Sprinkle with green or sweet red pepper and cheese. Serve with cherry tomato halves. Makes 4 servings. Nutrition facts per serving: 278 calories, 11 g total fat, 67 mg cholesterol, 440 mg sodium,24 g carbohydrate, 4 g fiber, 23 g protein. Combine evaporated milk, condensed milk, cream cheese, butter, eggs and vanilla in blender. Blend well. Pour mixture into prepared custard cups. Arrange in large pans; pour hot water into pans to 1" depth. Cook and drain manicotti shells as directed on package. Lay out on a sheet of waxed paper to cool. cilantro and garlic in medium bowl. Stir in chicken. Fill manicotti shells with chicken mixture. Coat bottom of 13 x 9 inch pan with some of the salsa. rrange filled shells in pan. Pour remaining salsa over shells. Sprinkle with remaining 1 cup of Monterey Jack Cheese. Cover and bake 40 - 45 minutes or until filling is hot in center. Makes about 10 shells. Serves 6 people. Crumble beef, onion flakes and garlic in a 2 qt. casserole dish. Cover and cook on HIGH for 5 min. Drain meat, and put into another bowl. Stir in soup. Spray an 8"x8" pan with cooking spray. Layer tortillas, cut up chicken, onion, sauce and cheese. Layer this way until all your ingredients are used up (3 layers). Sprinkle top layer with cut up black olives. Bake in 350° oven for 20-25 min. or until hot and bubbly. To prepare the shells, cut phyllo dough into 4-5 inch squares. Place 2-3 overlapping pieces into muffin tins. Bake according to manufactures directions. (You may even want to sprinkle them with cinnamon-sugar prior to baking. When cool, assemble. Place a scoop of ice cream in a "shell". Place frosting in a pastry bag with a flat wide tip. Squeeze out some lettuce. Add "meat", "cheese", "sour cream" and "tomatoes". fold and place seam side down in 9x9" casserole. Top with remaining mixture and rest of cheeses. Refrigerate overnight. Bake 45 min. at 350°F. Serves 8. Place tortillas in foil in a 350° oven for 15 min. to soften. place seam side down in a baking dish that has been coated with non-stick spray. Place each breast half between 2 pieces of plastic wrap. Pound chicken with a meat mallet to 1/8" thickness. In a bowl combine cornmeal and seasoning mix. Place egg in another bowl. For each roll, place 1 chili pepper on a chicken piece. Place 1 cheese strip atop chili pepper near one edge. Sprinkle with some of the cilantro and peppers. Fold in sides of chicken. Roll up, starting from edge with cheese. Repeat to make 6 rolls. Dip rolls into egg, then into cornmeal mixture. Place rolls, seam down, in a shallow baking pan. Bake, uncovered, in a 375°F oven for 25-30 min. Heat taco sauce. Insert a long narrow pie shaped strip of cheese in each chile. Dust completely with flour and chill thoroughly. Beat egg whites until very stiff with 1/4 tsp. cream of tartar. Beat egg yolks well with salt. dd to whites, sprinkle flour over all and then fold lightly together. Dip each chile in the batter, then slide it into about ½" of hot oil in a large frying pan. Be sure each chile is well covered with batter. Cover any bare spots with more batter. Turn chiles right away and continue frying until both sides are a golden brown. Don't crowd them in the pan. When done, drain on paper towels. Serve hot with sauce. Cook onion, garlic and pepper in 2 tbl. of oil until soft. Add remaining ingredients and cook for another 5 min. Mix about 3 tbl. flour with a little water until smooth; add to boiling sauce and cook for 3-4 min. until thickened. The chiles rellenos may be made ahead and refrigerated. To reheat, place in 350° oven for about 10 min.